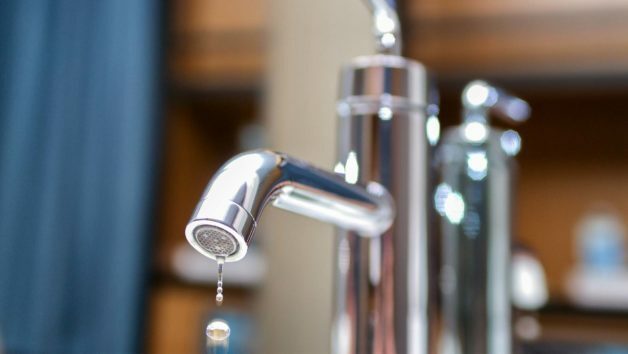 Drip … drip … drip … If you’ve ever heard this sound, you’ve probably pondered how to fix a leaky faucet—and not just because that repetitive noise is an insidious form of torture. The Environmental Protection Agency reports that a single seemingly innocuous leak can end up wasting 500 gallons of water a year, and raising your water bill by nearly 10%. So, for the sake of your savings account and your sanity, here’s a crash course on the steps and tools you’ll need to make this important home repair yourself. How much does it cost to fix a leaky faucet? If you go straight to the pros and hire a handyman or plumber, a leaky faucet repair can end up costing $150 to $250. That said, if you’re reasonably apt at DIY tasks it’s entirely possible to fix a leaky faucet yourself. It shouldn’t take long—less than a half-hour—and since your labor is obviously free, replacement parts are your only expense. While the price will depend on the model of your faucet, most name brands offer faucet repair kits that can be found at most home improvement stores for $10 to $20. Generally, leaks result from wear and tear and can be solved by simply replacing a few parts, although exactly which parts will depend on where your leak originates. Faucets can leak from three places: the handle, the base, or the waterline. For your classic dripping faucet, the problem is the water valve. Replace that, and your leak should be fixed. Here are the steps. Step No. 1: Turn off both the hot and cold water supply under the sink, then turn on the faucet to release any residual water. Close the drain, and place a kitchen towel over it to prevent any parts from falling in and getting lost. Step No. 2: Most single-handle faucets have plug buttons on the front or back of the faucet. Use a small flathead screwdriver to remove it; doing so will allow you to see the lock screw. As you remove parts, keep them in order, so that you’ll be able to put the faucet back together the same way later. Step No. 3: Use the hex wrench to loosen the lock screw until it’s loose enough to allow you to lift off the handle. Step No. 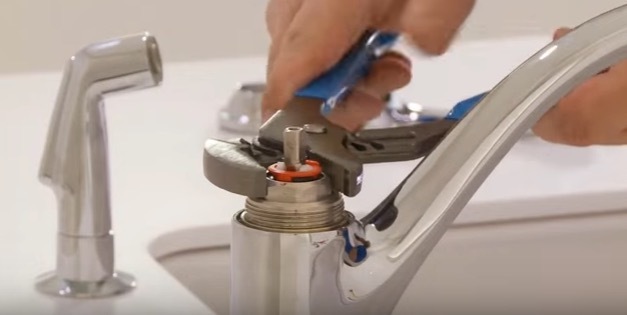 4: Once you remove the handle, you should be able to unscrew the bonnet of the faucet with your hands. Step No. 5: Use the pliers to remove the mounting nut. Step No. 7: Insert the new valve cartridge in place. On the bottom of the valve, there are two pegs that need to be aligned with two depressions in the valve body. In the event that your faucet uses washers and springs or a ball mechanism, you should replace those in the same formation as the originals, as well. Step No. 8: Reassemble the faucet in reverse order. Step No. 9: Turn the water back on, and test the faucet for leaks. The process for fixing this type of leak is very similar, except for turning off the water supply and accessing the lock screw. Since the leak is likely coming from either the hot or cold line, you’ll want to turn off the water lines one at a time to determine the source of the leak. If the faucet is still dripping after you turn off the first water line, you’ll know that the leak is coming from the other valve. After you’ve found the source of the leak, turn off both water lines and follow the same steps listed above to replace the defective valve. Double-handle faucets may not have the plug button referenced above in Step No. 2; instead they may have a cap across the top of each handle. You’ll need to use a coin or thin blade to pop off the cap before continuing to remove the lock screw.